Last summer I seeded two kinds of Swiss chard in the garden for the first time and as with most of our experiments I wasn’t sure how it would do in our garden. Two plants came up but they really didn’t do very well at first. There were just a few spindly leaves and I was fairly certain they wouldn’t survive, but the plants turned out to be hardier than I expected. They weathered the winter uncovered, even with ice storms and very cold temperatures, and they shocked me by popping back to life in the spring. 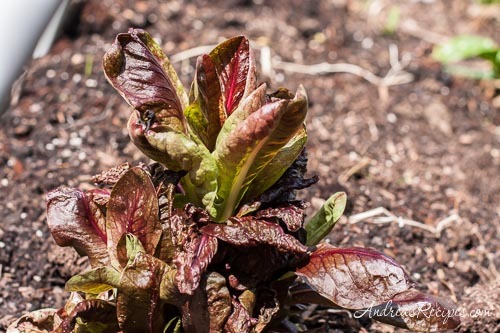 Those small baby leaves were tender and perfect for fresh salads, and as the plants grew larger I began to fantasize about sautéed chard, chard gratin, and savory chard pies. 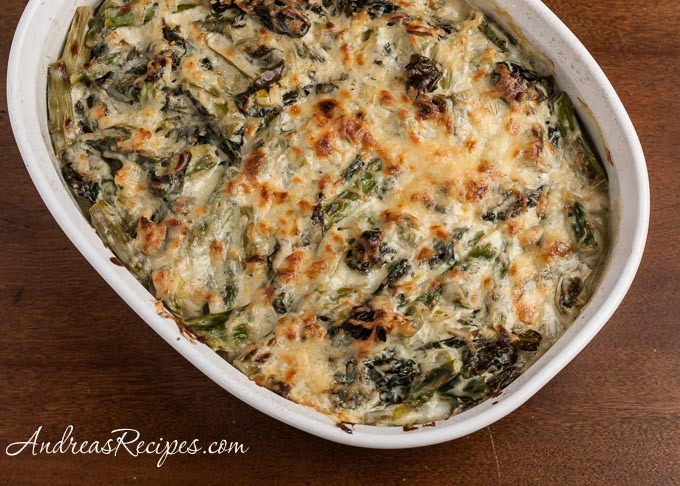 Then asparagus season started and I couldn’t resist combining chard and asparagus in a simple gratin. No complicated flavors here, just vegetables and a lush creamy sauce. I think I could get used to chard popping up in the garden every spring. Summer is coming back around and it’s time to start Grow Your Own, a blogging event that celebrates the dishes we create from foods we’ve grown, raised, foraged, or hunted ourselves. We hope you’ll join us this month, just send your post information to me at andreasrecipesgyo AT gmail DOT com by June 30. If you are new to the event, you can read more about the rules for participating at the Grow Your Own page. 2. Melt 1 tablespoon of butter in a 6-quart pot. Add the torn chard and sauté until it wilts, about 3 to 4 minutes. Remove the chard and drain in a colander, pressing to remove the liquid. 3. Melt the remaining butter and sauté the leeks until soft, about 3 minutes. Add the asparagus and sauté until it starts to glisten, about 2 minutes. Return the drained chard to the pot and stir with the leeks and asparagus. 4. Add the heavy cream and stir. Once it’s hot, add the cream cheese and cook, stirring, until the cream cheese melts and the sauce coats the vegetables. Pour the mixture into the prepared casserole dish and sprinkle the Swiss cheese on top. 5. Bake in the preheated oven until the cream bubbles, about 20 minutes. Move the rack to the top third of the oven. Broil the gratin until the cheese turns light brown, about 5 minutes. Remove from the oven and allow to cool about 5 minutes, then serve. Looks fantastic! Asparagus in about any form makes me happy, though, and add a little cheese? Glad you’re starting up GYO. I’m looking forward to participating, as my garden begins to produce more than lettuce, spinach, and herbs. We grew chard in San Jose. They did well, but we had some bug problems. How are yours faring? The two plants that took and weathered the winter are hardy, no bug problems. I’ve been looking forward to GYO too! such a great combo you have in that gratin! i’m drooling! Hi Jackie. The weight depends on how big the head is. If it’s in the 12 to 16 ounce range, it will work fine. Is there another vegetable I could use in this recipe, I do not like asparagus. Hi Jackie. You could use just chard or a mix of chard and spinach.